• Vincent Orange's promised land of big-box retail, "Washington Gateway," in the Fort Lincoln-New Town area (not to be confused with his dream of a "New Town" at the Capital City/Florida Market) near the intersection of New York and South Dakota Avenues. 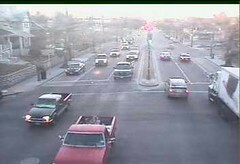 All of these drive home the importance of tonight's meeting and our ongoing input into the South Dakota Avenue Transportation & Streetscape Study. We need to counterbalance pedestrian-unfriendly developments like the Washington Gateway (why would we welcome folks to our CITY with a suburban sprawl-style strip mall with 2,000 parking spaces, and how many more will Ward 5 tolerate?!) with our input/demands to improve safety and accessibility on our primarily residential corridor. What: Nearly a year after the first public meeting, residents are invited to attend a community forum to discuss transportation and streetscape issues along South Dakota Avenue. Agenda: The meeting format will be an open house review of maps indicating preliminary recommendations for the first 30 minutes (6-6:30 pm), followed by a presentation at 6:30pm of the study process and findings. There will be a question and answer period after the presentation and time to review maps and complete comment forms prior to the 8pm closing. Etc. : If you have any questions about this meeting, please contact Emanuel Briggs at 202.478.1470 or at emanual.briggs@dc.gov. Visit the project website for additional information, including an online survey, study documents, and comments (pdf) from last year's meeting. Both the Brookland CDC (the site is still under reconstruction) and Richard Layman have brought to my attention the tagging of 12 buildings along Brookland's main street this past Wednesday, including our new Yes! 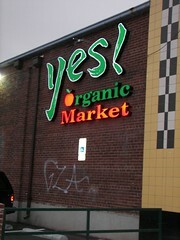 Organic Market and the Historic Newton Theater/CVS. I also noticed a few weeks ago the back of the Long & Foster at the corner of Monroe and 12th had been tagged pretty heavily. Many thanks in advance to Richard, the Brookland CDC, Alice Thompson - Ward 5 Neighborhood Service Coordinator, and DPW for cleaning this up in a timely fashion. What: Community walking tour covering the Brookland/CUA Small Area Plan site. The Cardinal's Nest is up and running! Though I haven't yet had the chance to go myself, a number of folks in the area have posted primarily positive experiences on both on the Brookland listserv and their blogs. Dear Friends and Neighbors of Brookland, I would like to welcome you to The Cardinal’s Nest coffee house, internet café, and lounge. We strive to give you the best products, prepared with fresh ingredients and with the strictest quality control. We aim to prepare food that will satisfy vegans, vegetarians, and carnivores alike! We are proud to serve coffee and tea from Orinoco Coffee & Tea, a private, family-owned company that provides gourmet coffee and tea exclusively to specialty stores and gourmet coffee and tea shops. Guests will have access to wireless DSL free of charge. In addition, we also have Ethernet ports and cables available for guest without wireless capabilities. 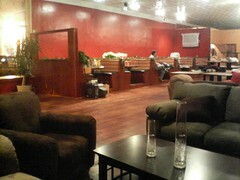 Over 200 power ports are located throughout the establishment available to charge any electronic device you will need! We would like to remind our patrons of the near proximity of neighboring houses on Perry Place. In an effort to minimize noise and disturbances to our neighbors, we would kindly request that patrons keep the noise down when leaving the establishment and refrain from parking on Perry Place at all times. Your help is greatly appreciated. We are proud to serve all our guests and neighbors and look forward to becoming part of the Brookland neighborhood. 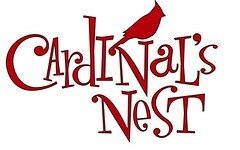 Call us at (202) 269-NEST or drop us an email at cardinalsnestdc@yahoo.com. » View the yummy and reasonably priced menu. » Visit our newest neighborhood hang-out at 3748 10th Street, NE, just two blocks from the Brookland Metro station. Agenda: TBA - though I imagine part of the meeting will include election of officers and formulation of committee structure. On Saturday, January 20, 2007, DC Parks & Recreation will host a Summer Job Fair at Turkey Thicket Community Center, 1100 Michigan Ave., NE, 10am-4pm. This is their first job fair of the new year, and each summer they have people join their summer staff to assist with implementation of DPR's discovery, overnight, sports, and aquatics camps. Last summer, more than 200 people were hired to fill numerous positions throughout all facilities. Bring your resume; qualified applicants will receive an interview. For more information contact the Human Resources Office at 202.673.7603 or visit DPR's website. You’ve seen those gorgeous garden photos published in magazines and newspapers. Enter this year’s competition and have a chance of getting your winning images published, too! Whether your take the photos in your own backyard, a nearby public garden, or while visiting friends and family in their local gardens, there are so many photographic opportunities to be found. Let’s show off the best in DC-area gardening! This contest offers an opportunity for all photographers to present their best shots of gardens in the greater Washington, DC area. Contest entries will be judged on technical quality, composition, originality, and artistic merit. More than $500 in prizes will be awarded! The first annual Washington Gardener Photo Contest entries will be accepted until midnight on January 22. For the full details, go to the Contests page on http://www.washingtongardener.com/, send an email to editor@washingtongardener.com to have a PDF version emailed to you, or see page 13 in the Jan/Feb 07 issue of Washington Gardener Magazine. Also see the info on their main page about the Washington Seed Exchange at the National Arboretum, January 27th, 12:30-4pm. 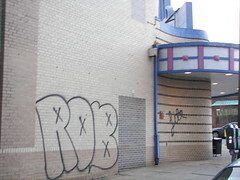 (Washington DC) – A contractor, working to rehabilitate a building located at 1229 18th Street, NE was shot nine times on January 13, 2007, after asking a group of youths to get off of his car. The victim, a law-abiding and peaceful family man is in stable condition following the shooting. The victim’s ten-year old child witnessed the shooting. The community was shaken again, the very next day by a shooting occurring at Yums Carryout, located at 1023 Bladensburg Road, NE. Two quadruple shootings and other shootings have resulted in four homicides within the last four months, shaking the very foundation of the Carver Terrace community. Commissioner India Henderson and former Commissioner Kathy Henderson will lead a peace march with citizens, Police Chief Cathy Lanier, 5D Commander Jennifer Greene and the Guardian Angels to denounce the violence in this community. Congresswoman Eleanor Holmes Norton, Mayor Adrian Fenty, U.S. Attorney Jeffrey Taylor, Ward 5 Councilmember Harry Thomas Jr. and all At-Large Councilmembers and clergy are invited to participate in the peace march. Fourteen Carver Terrace youth were recruited for neighborhood patrols as a direct result of the first Carver Terrace/Guardian Angels community march on January 10, 2007. Underscoring the peace march is a demand for the immediate installation of a surveillance camera for the 18th and M Streets area and heightened police patrols to restore law and order in the this community. 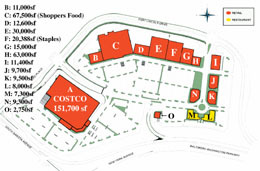 The march will begin at the corner of 17th and M Streets, NE, at 7:00 p.m.; on January 17, 2007. An emergency community meeting will convene at the DC Developing Families Center, located at 801 17th Street, NE, prior to the march at 5:30 p.m.
“We are tired of the violence in our neighborhoods and we want the police to step up and do a better job of protecting this community, stated longtime resident S. Harris”. » News on the January 6th murder of 17-year-old Lovell Harrison in the 2100 block of I Street NE from MPD and WaPo. UPDATE: Frozen Tropics has a roundup of the event and media coverage. • Election of Officers; formulation of Committee structure; consideration and approval of 2007 meeting schedule; consideration and approval of ANC priorities, projects, and speakers for 2007; etc. UPDATE: Notes from the meeting at bloomingdale (for now). Here's to a safe, healthy, and proseperous new year! I, along with seemingly every one else, have been summoned for federal jury duty. That, combined with an increasing workload, means posting will be sporadic at best for the next week or two. After that, I should be back in the mix, and I hope to incorporate more back-and-forth from readers (that's an overt wink-wink for comments).